So! You have one day in San Francisco. Maybe you’re passing through on your way to somewhere else. Or, maybe you know that our pretty city by the Bay is the eighth-most expensive city to travel to in the U.S., so you figured that a day here is all you can afford. If it’s the latter, never fear! 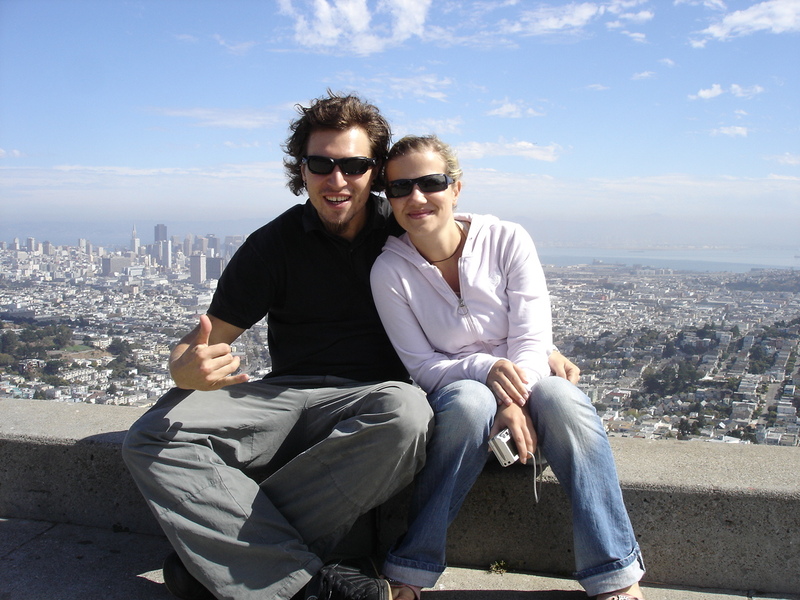 This blog post will walk you through how to spend 24 hours in San Francisco - on just 24 dollars. You heard it here first. Alright, now for the fun stuff! Let’s talk about your day in the city. Rise and shine and enjoy some free coffee and toast with jam at Pacific Tradewinds, if you’re staying with us. If you’re not, head to Daniel’s Cafe for coffee for $2.25 (large house coffee), and a bagel with butter for $2.50, or an egg and cheese bagel for $3.25. After breakfast, walk to Union Square. You know those painted heart statues in all the movies? This is where those are! Check those out, take some pictures, walk around, and take in the sights. While you’re doing this, you might notice a cable car or two driving past you. We know it’s considered as an iconic San Francisco thing to do, but the truth is, they’re expensive - $7 each way. That’s $14 just to ride a cable car up and down the street! We suggest skipping the cable cars, because not only are they expensive, they actually take you to many less destinations than MUNI busses ($5 for a day pass) or your feet (free) can. Instead of taking the cable car, take the 45 bus to Lombard Street, i.e. the “crookedest street in the world.” Check it out, take some photos, and enjoy the view. You can then either walk 20 minutes or take the 30 bus to Pier 39, otherwise known as Fisherman’s Wharf. One of the most touristy “San Francisco” things to do is to stroll along the pier and get a clam chowder bread bowl for lunch. Honestly, Pier 39 has some sea lions that are fun to look at, but aside from that, it’s mostly just lined with seafood restaurants and souvenir shops. You could easily burn up your entire $24 in any one of those places. One bread bowl alone can easily run you $10. And that’s minus the sales tax. Instead, we recommend strolling around Pier 39 to see what it’s all about and check out the sea lions, but we suggest you skip the souvenir buying and head elsewhere for lunch. If you’re staying at Pacific Tradewinds, you could walk the 25 minutes back to our hostel to indulge in our free ramen or PB&J sandwiches before heading back out to keep exploring the city. You can also take your lunch with you! We have lunch boxes and thermoses and we are more than happy to lend you so you can take your sandwich and ramen with you while exploring the city. Otherwise, you can grab lunch in the Mission District, where there’s a plethora of affordable (and delicious) food options. To get to the Mission from the wharf, you can hop on the F trolley and take it to BART, and then take a BART train to the Mission and get off at 16th Street. From the hostel, you can take BART directly to the mission. BART is not included in your MUNI transfer or $5 MUNI day pass. Two of our favorite affordable Mission District lunch options are Panchita’s #2, a Salvadorian restaurant with savory $5 pupusas filled to the brim with a filling of your choice, and Taqueria El Buen Sabor, where you can get a bean and cheese burrito for $4. Way better than a bread bowl. After lunch, take a stroll down Clarion Alley, an alleyway lined with bright, creative murals. This is a must-see if you love street art, and a great place to take photos. With your belly full of burrito and your camera roll full of Instaworthy Clarion Alley photos, go chill for a second at Dolores Park. 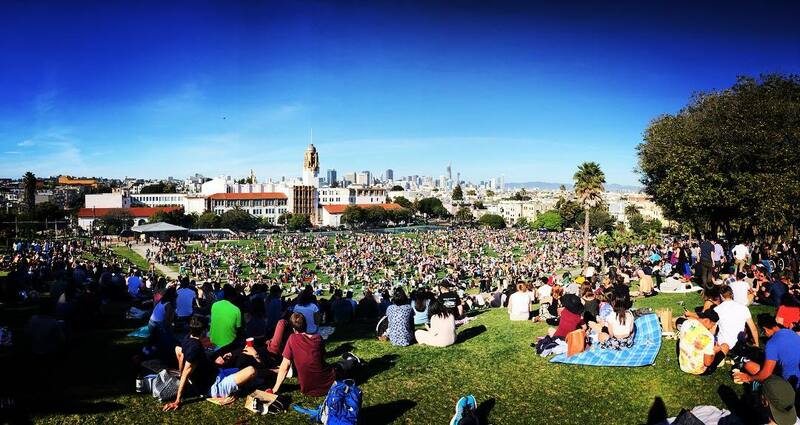 On warm days, Dolores is super crowded with people laying on the grass eating, drinking, and just hanging out. On weekends, it’s a popular place for birthday parties and other gatherings, and a great place to meet new people. Maybe bring a blanket to sit on, and definitely remember to pack your trash. Dolores Park also has an epic playground with a dope city view from the top of the slide. If you go down the slide a few times and still want more slide action, you can walk 17 minutes to the Seward Street Slides. These are two long, steep cement slides that are good, free fun, but not for the faint of heart. Or very clumsy. Sitting on a piece of cardboard is recommended for maximum slideage, but if you don’t happen to be casually carrying one around the city with you (since that is a totally normal thing to do), never fear - there are usually some sitting at the top from previous sliders. Other random sliding people will also likely share theirs with you. We’re a friendly city. Hmm, let’s see. You’ve spent almost a whole day in San Francisco. You’ve seen some sea lions. You’ve taken some great pictures. You went down a huge cement slide. You learned all about our transit system. What are we missing? Oh yeah! There’s like a bridge or something, right? Head to Twin Peaks for the sunset (37 bus and 31 minutes from Dolores). From here, you’ll not only be able to see a great view of the Golden Gate Bridge, but also a view of the whole city. Be warned though - it will be windy! When the sun sets, head to Hong Kong Clay Pot for a hearty plate of Chinese food for under $10. After dinner, walk the six minutes back to Pacific Tradewinds for free games and activities with your new hostel friends. Check out our events calendar to see what we’ve got on tap for the day you’ll be around! Also, make sure you take advantage of one of San Francisco’s great weekly drink deals. If you’re here on a Monday, for example, you can grab $2 well cocktails at Q Bar in the Castro.